Jaguarundi is a medium sized wild cat, which belongs to the Felidae family. It is slightly larger than the common house cats. Sometime the Jaguarundi is mistaken with an otter or weasel. The Latin name for this species is Puma yagouaroundi. This species has a long thin body with small legs. It has short rounded ears and a long tail that sizes around 30 to 60 cm. Its body is covered with small and smooth hairs. Males of this species are heavier and larger than the females. Jaguarundi varies anywhere from 60 to 70 cm in length. Its shoulder height is around 30 cm. This animal weighs according to its size. 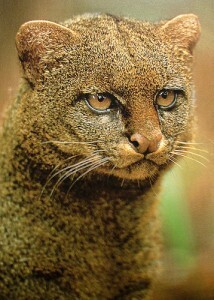 The body weight of an adult Jaguarundi can be around 8 – 9 kgs. The color of this species is primarily dark grey and dark brown and is uniform all through the body. Dark red and chestnut colored varieties of Jaguarundies can also be found. The color is slightly light on the underside of its body. In dry areas, Jaguarundies are light colored. In forest regions, however, they tend to be darker in color. Herpailurus yaguarondi yagouarondi (Amazon Rainforest, Guyana). Herpailurus yaguarondi fossata (Honduras, Southern Mexico). Herpailurus yaguarondi melantho (Brazil, Peru). Herpailurus yaguarondi cacomitli (East Mexico, southern part of Texas). Herpailurus yaguarondi eyra (Brazil, Argentina, Paraguay). Herpailurus yaguarondi tolteca (West Mexico, Arizona). Herpailurus yaguarondi panamensis (Ecuador, Nicaragua). Herpailurus yaguarondi armeghinoi (East Argentina, West Chile). In the northern part of the American continent, it is found in Southern Texas and coastal Mexico. A number of this species has also been found in the US states of Florida and Alabama. Depending on the local environment, their territory range may vary from 20 – 100 square km. Males tend to have larger territory than females. Unlike other wild cats, Jaguarundi is not primarily a nocturnal animal. It prefers to be active during the daytime rather than in night. Though a solitary animal, these are generally spotted alone in their wild habitat. They live in pairs during the mating season. They have occasionally been spotted to be staying with other members of their own species, even at times other than the mating season. Like most species of cats, these creatures mark their territory by urination and scratching on the branches. Like Jaguars, they can climb up the trees quite well. They are often spotted spending time in the branches of trees. This animal spends a relatively secret life as it stays in a well protected den. This species is very vocal. They can produce at least thirteen different sounds that include purrs, chattering sounds, nasal sounds and whistles. It also feeds on a lot of other small species. This creature is a very good swimmer and also preys on small fishes. It has been spotted to prey on creatures that are larger in size than Jaguarundi, such as rabbits. Reports suggest that these animals can jump high up in the air and catch their prey, such as birds. They have a reputation of invading into poultry firms and kill small firm animals. Like most other wild cats, their diet also includes fruits and little amount of vegetation at times. The breeding season of this animal is not exactly known. Scientists suggest that breeding happens throughout the year, in tropical regions. In other regions, mating is reported to happen around December. Females show signs of heat by urinating in locations or giving faint calls around its territory. Males reply with loud screaming. The sexual heat in female lasts for around 50 – 60 days. Female gives birth in a small cave or in a hollow tree, after a gestation period of around 80 days. A litter of this creature consists of 1 – 4 kittens. The Jaguarundi kittens are born with light spots on its body. The spots disappear as it grows older. Kittens take solid food within two months. After around three months, its mother teaches them the skills of hunting. A young one of this species generally becomes independent within one year. For how long the young kittens remain in their mother’s territory is still unknown. It is also unclear whether the males take part in raising the kittens or not. A member of this species reaches sexual maturity at 2 – 3 years of age. This species lives for around 15 years in its natural habitat. It is known to have lived up for ten years in captivity. 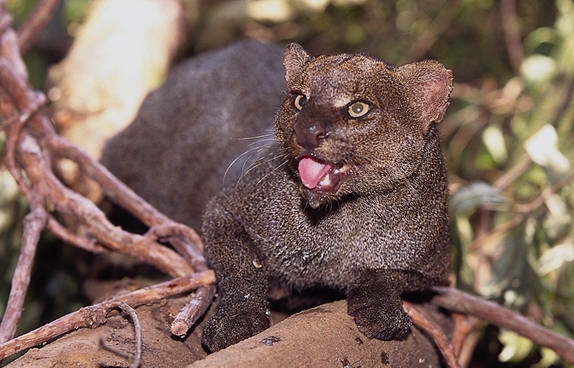 The predators of Jaguarundi include large carnivores as well as humans. This animal is known to cross lakes and narrow low current rivers. Genetically, this cat is closely related to cougar. 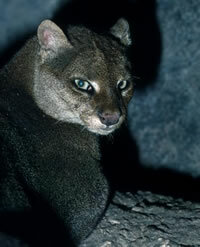 Jaguarundies are shy animals and they are cautious of man-made traps. This species is called by different names in different regions names, such as – Yaguarundi, Leoncillo, Onza, Gato Moro. The numbers of these cats are decreasing day by day, not because it is widely hunted, but because it is losing its natural habitat, due to deforestation and spreading cities. Due to their knack of killing firm animals, they are often shot by farmers. They also get caught in traps. Hunting this species is illegal in countries like Mexico, Brazil and Argentina. This animal is listed among endangered species in some places in the United States where it is very hard to spot it in its natural habitat,. The communities around the Lower Rio Grande Valley (Texas) have begun to introduce native shrubs so that the habitat of this animal can be restored. Texas Parks and Wildlife Department stated that Jaguarundis in South Texas may have become endangered due to the loss of their natural habitat. According to the IUCN Red Book, Jaguarundi is classified as least concerned species. Four subspecies of this animal is listed in Appendix-1 and the other four are in Appendix-2 of the Convention of International Trade in Endangered Species of Wild Fauna and Flora (CITES). In the list of US Fish and Wildlife Service, this species is regarded as endangered. Check out some of the pictures of Jaguarundi to know more about this mammal. Thank you very much for this information. It was very helpful in writing my research paper. My wife is a nurse, a former United States Military Officer, owns her own business, and is very observant and detail oriented. This past Thursday morning, March 12, 2015, around 10 am, while driving through our neighborhood, she saw a strange looking animal that she described as feline looking, but not a house cat. It also did not have the same size and shape of the Bob Cat that people have seen a time or two around here. She did an Internet search and found an image that fits the feline sighting she observed. It was a “Jaguarundi.” We kind of live in the country, just south of Nashville. Thanks for the info. We have recently had a jaguarundi show up in our neighborhood. At first we were not sure what it was. But after seeing it and hearing it rather large vocals we knew what it was. We have contacted the Feline Research Program to see if they would be able to catch it and relocate it somewhere safe. Right now he is roaming a busy subdivision and we fear for his safety.